To buy the Bret Zvacek Quintet’s CD “Day in May,” click here. CNY Jazz Orchestra Music Director Bret Zvacek has shared the stage with numerous jazz legends including Slide Hampton, The Woody Herman Orchestra, and many others. He is a graduate of the University of North Texas, where he founded the Contemporary Jazz Orchestra. He is Professor of Music and Director of Jazz Studies at the Crane School of Music, Potsdam, NY, and he has also served as an adjunct faculty member of the Jazz Studies department at McGill University, Montreal. In demand as clinician, he serves on the staff of numerous summer jazz camps and has given workshops at several state conferences. 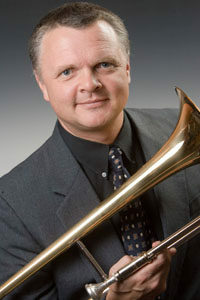 Zvacek’s music has been performed and recorded by professional groups including the Count Basie Orchestra and the Air Force Band of Flight/Night Flight Jazz Ensemble. Zvacek also has led numerous college and university groups. Currently president of the New York State unit of the International Association for Jazz Education. Rick Montalbano, Associate Music Director, is the pianist for the CNYJO and performs with the Syracuse Symphony Pops and the Symphony Rock Ensemble. An arranger, composer, performer, and session player, Montalbano still finds time to serve as Adjunct Professor at Colgate University, SUNY Marcy, and Hamilton College. He leads a busy schedule, accompanying top jazz musicians and working as a clinician at the high school and college level. In addition to performing with outstanding jazz musicians–such as Chuck Mangione, Phil Woods, Louie Bellson, Randy Brecker, Eric Alexander, Joe Magnarelli, Lionel Hampton, Doc Cheatum and Clark Terry–Montalbano has toured with the Drifters, the Five Satins, and Jackie Wilson. He’s also worked with Lou Rawls as musical director and pianist. As Manager/Engineer of the Music Factory recording studio, he writes and produces commercials, arranges for musical acts, and performs soundtrack recording for TV, radio, and film. Montalbano also is the Entertainment Director/Pianist for the Savoy, where he created the Savoy’s Sunday Night “Jazz Cabaret Series” along with one of the area’s most popular events, “Jazz Along the Mohawk,” which features some of the country’s finest jazz musicians and vocalists. His band, the Rick Montalbano Trio, has served as the house group at Tiny’s, a premier jazz club in Utica, NY, backing up national and regional jazz greats. Additionally, he serves as musical services contractor for the Turning Stone Casino in Verona NY.